Looking for a super cool Halloween mask? NEVERMORE will you have to search! This moveable-mouth Raven mask is original and fascinating! The movement and sound effects are brilliant and will have everyone mystified and terrified! Legends come to life with this illusive classic Halloween horror story character animated mask with scary sound effects! See VIDEO below. Detailed raven face is black with beady eyes, cawing beak and shrieking mouth. The Beak opens when you open your mouth! 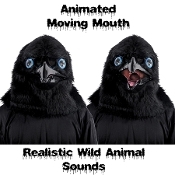 Mouth moves when you move your mouth, creating the illusion of a real crow! Black Bird mask is made from molded plastic and covered in faux fur feather-inspired fabric with beady eyes. Lightweight, comfortable and easy to wear, this realistic Raven mask is made from molded plastic and covered in fake fur. Comes with push-button activated loud cawing wild bird sounds that you operate by a push button device you hold in your hand (a cord runs down your sleeve). Creates an authentically terrifying and realistic attacking bird effect! This Halloween cosplay mask is lightweight, comfortable and easy to wear. Adjustable foam inserts enable a snug fit at the jaw for realistic movement.